This article is about the coffee. For the streaming applet, see Cortado (software). The word cortado is the past participle of the Spanish verb cortar (to cut), in the sense of "dilute", and can refer variously to either coffee or espresso drinks throughout Spain, Portugal and Cuba. 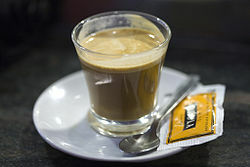 In Spain a café solo corto or a café cortado generally both refer to single espresso shots with foam, while the term cortado is itself broadly associated with various coffee or espresso beverages having been "cut" with milk. The café solo corto may in fact be interchangeable with the Italian macchiato or similar to the French noisette. The cortadito in Cuba specifically implies a small beverage similar to the café solo corto consisting of a standard 1oz espresso shot; however, unlike the solo corto, the Cuban cortadito is generally cut with heated sweetened condensed milk, being a more available preserved form of milk, whereas fresh milk was historically often unavailable. A cortadito is usually served in a special glass, often with a metal ring base and a metal wire handle. There are several nominal variations, including cortado condensada, café con leche condensada or bombón (espresso with condensed milk); leche y leche is a similar variation, but with both condensed milk integrated throughout and a dollop of cream resting on top. Brought to the Little Havana neighborhood of Miami, Florida, by Cuban-Americans in the 1960s, the cortadito drink is now found throughout the city, and is an important part of everyday culture, particularly among Cubans. However, the cortadito is a drink distinct from Cuban-style coffee, which includes sugar in addition to milk, and has its own brewing method as espresso. In non Spanish-speaking countries where it appears on a specialty coffee menu, however, the cortado should generally be distinguished from the Italian caffè macchiato, cappuccino, or a flat white. A macchiato has only a small amount (a 'mark' or spot) of milk foam added, while a cappuccino has a head from both foam and milk. A flat white is generally made with a similar equivalent ratio of espresso to milk, but uses steamed and textured (e.g. microfoam) milk, resulting in a hotter and lighter drink, more closely related to a latte. A similar drink in Australia is known as a piccolo latte, or simply a piccolo. This is a single ristretto shot in a macchiato glass that is filled with steamed milk in the same fashion as a cafe latte. A larger drink, popular in Portugal, is the galão, which uses 1:3 proportions but is otherwise similar to both cortados and manchados. In Catalan, tallat takes the role of describing being cut, with the closest word in Basque being ebaki, and pingado or garoto in Portuguese. In the United States the meaning of the name can vary by region but on the East Coast it is generally known as a cortado. In the Czech Republic, Costa Coffee sells cortado under the marketing name corto classic. A gibraltar, served in San Francisco. A diagram of coffee drinks in Silicon Valley, showing an archetypal gibraltar. The name gibraltar originated in San Francisco, California, where roasters – first Blue Bottle Coffee Company, later Ritual Coffee Roasters and others – started the cortado trend by serving the drink in Libbey Glass Company glassware by the same name. Whereas a cortado is a broader term for many a cut beverage, a gibraltar is specifically defined in its proportions by the constraints of its cup size: a Libbey 'Gibraltar' glass contains 4.5 oz, 2 oz of which are filled by a standard double espresso shot and the remainder filled by well-integrated microfoam. It was developed as a readily available profiling beverage for immediate consumption, and is typically identifiable from cortados as having a richer, more velvety texture and a cooler, lukewarm temperature. Because of its temperature, emulsified milk integration, immediate consumption and lowered acidity, the gibraltar is especially good for profiling naturals with their hints of strawberry or blueberry. ^ "Nápoje" [Drinks] (in Czech). Corto classic. Jemná a krémová káva, ze dvou shotů směsi Mocha Italia, s mléčnou pěnou zdobenou technikou latté art.